Keeping a Schedule While Mom is Sick. 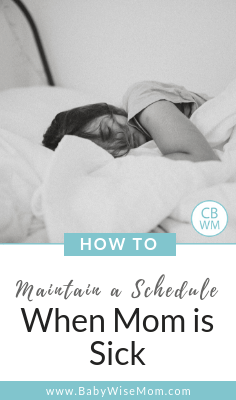 How to maintain a Babywise schedule when mom isn’t feeling well. What to hold on to and what to let go. 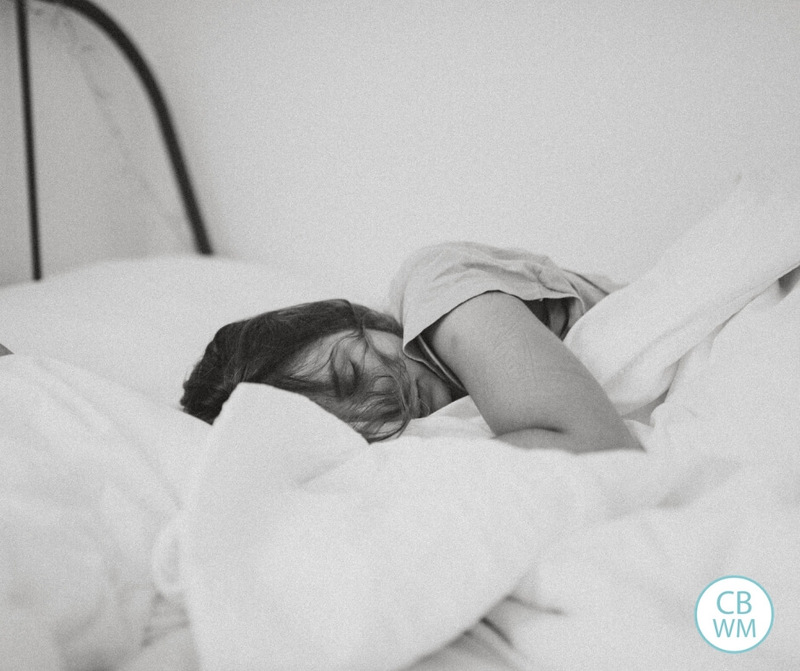 This topic is on my mind as I start to slowly come out of the fog of first trimester life. There are going to be days when mom (or primary caretaker) is sick, whether from pregnancy or the flu. Sometimes you will simply get a nasty cold that really just takes your energy. So what do you do in these situations in regard to your schedule? These are hard times for mom. These are the some of the times that really refine mom and cause that unconditional love for her children to grow and to help mom develop more charity. While it is just mom and the kid(s), mom doesn’t get to rest much. Hopefully when Dad gets home, he gives mom a chance to rest. If mom is nursing a baby, though, chance for rest is less likely. It is important, however, for mom to take care of herself as best she can. You can’t do much for your family if you are sick. You will take longer to get better if you don’t get the rest you need. When you are pregnant, you have to watch for your health for you and for the benefit of the baby you are growing. Luckily, there are many aspects to the Babywise schedule that make these situations easier for mom. The child(ren) has independent play. During this time, mom can sit or lie down and relax. Infants up through preschoolers will have at least one nap, giving mom more opportunity for rest. The older child who no longer needs a nap will have a rest time when mom can relax. If you have more than one child, your children also have sibling playtime to play with each other and give you a break. However there are also many aspects of the Babywise schedule that can be hard to fulfill while mom is sick. For example, structured learning time for the preschooler can be hard for mom to fulfill if she is sick. This is something that has been neglected around our house while I have been sick. This pregnancy has been especially hard on me. I have been extremely sick with no relief and extremely tired. I am sure my fatigue is much compounded by the fact that I am caring for two young children. It has basically been a matter of survival for me. Brayden has watched more TV than I would have preferred under normal circumstances. At least it was educational programming, but it is still television. He has been quite understanding of my need for rest, with great concern over my well-being and no complaints. Just last night my husband told Brayden they were going to leave to get new tires for one of our vehicles. Brayden responded, “No, I need to stay here in case Mommy gets sick and needs me” (isn’t that such a typical dutiful oldest child remark?). My husband explained that I would be better able to rest if Brayden went with Daddy, so he happily agreed. Kaitlyn hasn’t had life too differently from usual. She isn’t interested in TV yet, so she isn’t getting any of that. She does love to cuddle and when I lay down when she is awake she is quick to come cuddle up to me and bring a book along for me to read to her. Since she still takes two naps, has independent play, sibling play, meals, and getting ready each day, her day is pretty full. When you are sick and need to care for yourself, don’t be afraid to take care of yourself as you need to. Brayden had about a month with more TV than usual. It wasn’t even a TON of more TV , it was probably usually 30 minutes a day extra. But it is still more. He and Kaitlyn have spent more time in sibling play than would normally happen in a day. After this month, I was able to have enough energy to once again have structured learning time and other activities. He is perfectly fine. Yes, I felt guilty a lot during this period. I had to remind myself that it was a relatively short time. He would be fine. While I am definitely not up to par, I can spend energy during their waketimes and still rest as needed during naps and independent play. The times you are sick are the times to employ flexibility. You can get back to normal soon enough if you take the needed time to rest. Try to not feel guilty. I know it is hard for most of us. Do what you can and ease up on what you can. Try to figure out where you can relax the structure. If your child is a big lover of independent play, you can extend it a bit longer. Is it sibling play? Let them play longer. You can always be flexible when needed. GREAT stuff and thanks so much. We as moms need to hear another wonderful mom tell us to actually take it easy sometimes. Hope you start feeling better soon! Great post!!! How true, how true! I am glad to hear you are starting to turn the corner of the first trimester funk! I’ve been praying for you and I’ll keep doing that. I don’t know how you do it with 2 kids and one on the way and still have time for this blog and helping everyone. I can barely take care of 1 and I’m not sick. Thank you. This is definitely off-topic, but I am getting bashed for following the Babywise principles. The attachment parenting camp is saying that putting a baby on a routine makes you less attuned to their needs & that letting them CIO is just barbaric. I try not to let it get to me, but I have trouble expressing myself when they attack my parenting like that. I would really appreciate if you could do another Babywise Myth post about Babywise keeping parents from getting to know their baby and CIO causing emotional distress with lasting effects. We all know this is nonsense of course, but I really have a hard time explaining it to those attachment parenting moms. Thanks, I love this blog, it's helped me so much! I appreciate so much that you do this all even while pregnant and with 2 little ones at home. You are welcome Daniel! I am so sorry you all have been sick.